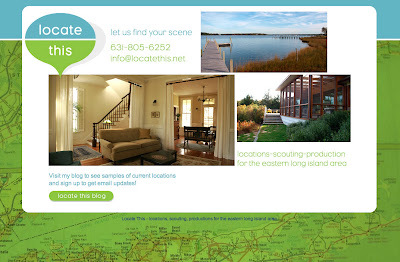 One of the many projects I have been working on is an identity and website for eastern Long Island location scouting service Locate This. I started off creating a logo based on conversations with the client. I wanted to get a sense of her style so I had her send me examples of logos that she liked and explain why she liked them. From various resources I pin-pointed her style and came up with logo options I thought would work. We finally settled on a map-marker shape for it's clean and modern look. The colors were chosen based on a two factors; the client really likes the color green and also the blue/green combo echoes the sky/landscape relationship. Then I designed and launched a placeholder page so she can start establishing her brand on the web. 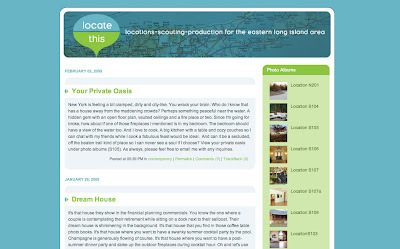 Also, armed with a subscription to Typepad, I selected a template that I thought would work and then customized it with graphics, colors, and fonts to create a blog so she could immediately start uploading and publicizing her locations. Work on the website has begun and it will feature a content management system that will make it easy for my client to add new locations into the database. I love the logo and colors! I wish the google maps locator looked this good. Great idea!! thanks D! she has some really nice locations too.